To him be glory and empire for ever and ever. Amen. The very words of the Glory Be Prayer of the Catholic Rosary create a reassuring peacefulness. You can find Jesus' command to baptize all nations in St. Matthew's Gospel. Jesus uses the following phrase which acknowledges the relationship of the Blessed Trinity. The Glory Be prayer continues by professing that God is everlasting. The Father, Son and Holy Spirit were one from the beginning of time and will continue to be forever. This is a Biblical truth and is supported by many passages in the New Testament. The phrase "glory forever" is repeated throughout the Letters of St. Paul as you can see from one of the above Bible verses. Such comfort and peace can come from the knowledge that God loves you and takes care of you. He has from the moment of your creation and will continue to forever. When you believe that God is in control of your life you can live in complete peace and security. Many Catholic prayers, including the Glory Be prayer, were formed to combat false teachings. This has brought much tranquility for Catholics - being able to confidently believe in the truths of God. ...knowing where to turn to find them. As early as the year 300 Catholics began using the phrase, "Glory be to the Father, and to the Son, and to the Holy Spirit". This phrase became popular for two reasons. The first reason is because it is fitting to praise God in this form following the example Jesus gave when He instructed his followers go out and baptize. And secondly to defend and promote the belief in the Blessed Trinity. The belief in three divine Persons in one God. In the year 529 the second part of the prayer was added. "As it was in the beginning, is now, and ever shall be, world without end." This phrase was added to confirm that there truly are three Persons in one God. That the Son and the Holy Spirit were one with the Father in the beginning, now and always will be. During that period up until present day, there have been two forms of this prayer. 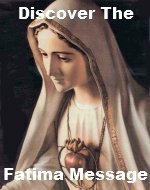 The short or minor prayer that is used in the Catholic Rosary prayers and the greater or major prayer which is prayed during Catholic Mass. 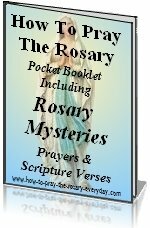 By the 600s the Catholic Rosary prayer, the Glory Be Prayer, has been prayed in the exact form as you now pray it. It has always been a fitting prayer to use when ending a longer prayer form. Traditionally it was used at the end of the psalms and after a sermon and of course after each decade of the Rosary prayer.